Branded entertainment and content marketing seem to be everywhere now. But relatively few brands of any size, in any category, have to date demonstrated the full power of these creative platforms as resoundingly as Chipotle Mexican Grill. As the advertising community is well aware, the fast-casual restaurant brand, working with creative agency CAA Marketing, has now bottled viral lightning twice in two years with groundbreaking, feature-movie-quality animated videos. “Back to the Start,” a two-minute cautionary tale about a pig farmer who ultimately rejects an industrial farming model in favor of a more sustainable, humane one (backed by Willie Nelson performing Coldplay’s “The Scientist”), proved so popular after its online release in August 2011 that Chipotle released it in 5,700 theaters. Its resounding success in theaters led Chipotle to use the film as its first-ever national TV ad, aired during the 2012 Grammy Awards. That video, which derived its power from its emotional narrative and barely-there branding, generated a frenzy of media coverage, as well as social buzz/sharing — resulting in 8 million-plus YouTube views (to date). 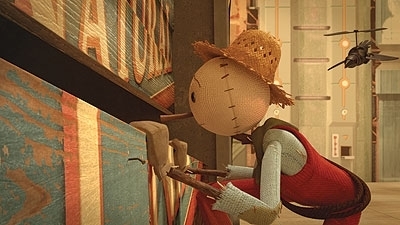 This year’s three-minute follow-up video, “The Scarecrow,” tells the story of a dystopian world in which a scarecrow is forced to work in an industrial food factory, with Fiona Apple’s mournful cover of “Pure Imagination” underlining the “Cultivate a Better World” message. Posted on YouTube in early September, this video — without support from TV or other traditional paid media — managed to top “Back to the Start”’s viral performance, drawing more than 5.5 million views in its first week alone, and nearly 7.4 million within two months. “The Scarecrow” was also designed to serve as the trailer for a free iOS game that let players earn buy-one-get-one free (BOGO) deals on Chipotle menu items. Supported by a small online and mobile ad campaign, plus PR outreach that generated more than a half-billion media impressions, the game — which delivers sustainability messages in a fun way — had been downloaded 500,000-plus times by mid-October. Those home runs alone would make Chipotle a natural for Media Client of the Year. But importantly, they’re part of overall marketing and advertising strategies that are both unique among restaurant brands and an inspiration to brands across categories. Every aspect of those strategies is laser-focused on reinforcing and building awareness of the “Food with Integrity” brand mission that is Chipotle’s core differentiator — its promise to deliver “fast” food that’s not only fresh, but from sustainable sources wherever possible. Chipotle — now celebrating its 20th anniversary — has developed those strategies in-house, having famously dropped the standard agency-of-record model in 2009, after Mark Crumpacker became its first CMO. The guiding principle, as expressed by Crumpacker, is building meaningful, emotional connections with the brand. Chipotle is achieving that (oft-cited but frequently elusive) goal with an educational, discussion-driving approach that appeals to “conscientious eaters,” including hype-averse Millennials. That approach is apparent in its advertising, as well as its other innovative marketing initiatives. Chipotle has largely shunned the restaurant industry’s ubiquitous limited-time, value-priced menu item promotions — and the costly, TV-reliant campaigns that drive those. Instead, it’s focused on OOH, radio, print and online ads designed to foster lasting brand relationships by getting people to think and talk about where their food comes from and how it’s prepared. This year, for instance, it ran a new “Skillfully Made” campaign, with billboard and radio ads highlighting its brand differentiators, which has driven noticeable traffic and sales lifts, according to Chipotle founder, co-CEO and chairman Steve Ells. Chipotle continues to be the envy of much-larger chains and brands because of the massive exposure it enjoys, despite its super-lean measured-media budgets. For example, it spent just $5.8 million on measured media in 2011, and $7.5 million in 2010, per Kantar. While it’s upped ad spending somewhat in fiscal 2013, its marketing costs as a percentage of sales will be only about 1.6 percent. Chipotle’s connection-marketing programs include Cultivate, a series of festivals combining live music, celebrity chef demos and experiences that inform attendees about organic, sustainable food sources, held in various markets each year since 2011. 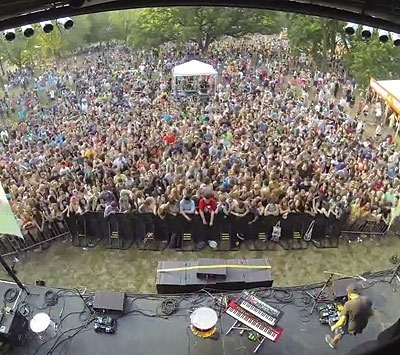 2013’s events in San Francisco, Denver and Chicago each drew more than 100,000 attendees. Further, the advertising and media coverage around the events have produced “strong, positive” brand perception benefits even among non-attendees in the markets, reported Ells. Chipotle has also taken an unconventional approach to its first loyalty program, dubbed the Farm Team. Instead of the typical frequency-based BOGO rewards system, this invitation-only program rewards members for learning about food sourcing by taking online quizzes, and for sharing the knowledge via social media. One of Chipotle’s latest initiatives is a sponsored-content “Food for Thought” area within The Huffington Post site, dedicated to “creating awareness about how food is grown, raised and prepared and the effects this system has on us.” The platform offers posts and articles from experts and knowledgeable consumers — along with links to Chipotle’s videos and apps. Indeed, while fast-casual Chipotle is still dwarfed by the big QSRs, it’s among the fastest-growing, best-performing restaurant chains in the U.S. Last year, Chipotle’s systemwide sales jumped 20.3 percent, to $2.7 billion, its same-store sales rose 7.1 percent, and its diluted EPS rose 29 percent, to $8.75. Its momentum has continued in fiscal 2013, including a 15 percent profit increase in Q3, and projected full-year revenue growth of 16 percent. Karlene Lukovitz is a regular contributor to MediaPost's "Marketing Daily," "InPublishing" (U.K.) and other business and consumer publications, and edits "MBR Daily Publishing & Retail News," a newsletter for publishing and retail executives. You can reach her at klukovitz@klmedialink.com. Supplier of the Year: Acxiom - Who's On First, What's On Third?